We show that the minimal rate of noise needed to catalytically erase the entanglement in a bipartite quantum state is given by the regularized relative entropy of entanglement. This offers a solution to the central open question raised in [Groisman et al., Phys. Rev. 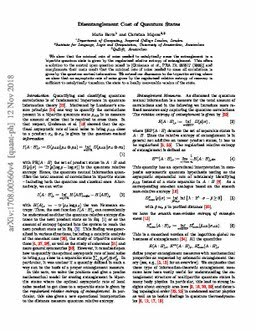 A 72, 032317 (2005)] and complements their main result that the minimal rate of noise needed to erase all correlations is given by the quantum mutual information. We extend our discussion to the tripartite setting where we show that an asymptotic rate of noise given by the regularized relative entropy of recovery is sufficient to catalytically transform the state to a locally recoverable version of the state.